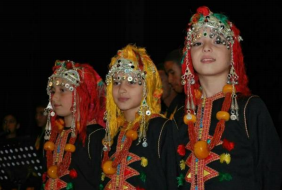 In support of the indigenous people of North Africa, the Tazzla Institute for Cultural Diversity is holding its 6th annual Los Angeles Amazigh Film Festival on Saturday, December 6, from 2:30 pm to 7:30pm at the Wells Fargo Theater. Tickets are available on their web site www.laaff.org for $15.00 each, and at the door the day of the event for $20.00. This year’s festival will offer the West Coast premieres of three award-winning documentaries regarding Morocco. Two of the films are directed by well known producer, Izza Genini (Vibrations in the High Atlas and Nuptials in the Middle Atlas). LAAFF will also salute the work of Dounia Benjelloun (Sand Hill Production, Casablanca and New York), who has contributed each year to this festival, by showing her award-winning 2012 documentary Palm Grove School. In addition, the program will feature the very special documentary created by Dr. Wassim Korbi, recipient of several awards, called Azul (Tunisia). Among the attendees, LAAFF will be honored by the presence of Moroccan producer, Mr. Ahmed Baidou, who will present a short on the city of Agadir, which was devastated by a 1960 earthquake. He will also be screening his latest feature film, Aghrabou (the Boat), which won the Best Film Award at last year’s festival. This event is primarily sponsored by the BMCE Fondation of Morocco, and by A.C.A.A., Amazigh Cultural Association in America.